We’d love your help. Let us know what’s wrong with this preview of Haunting Magic by Neely Powell. For generations, the Connelly witches made a great sacrifice to protect their town. In exchange, New Mourne remained a refuge for humans and supernatural beings to live in peace. Now Brenna Burns, or another chosen female of this generation, is next in line to die—unless Brenna can find a way to end the cur An enchanted town. A vengeful spirit. A powerful coven under siege. For generations, the Connelly witches made a great sacrifice to protect their town. In exchange, New Mourne remained a refuge for humans and supernatural beings to live in peace. Now Brenna Burns, or another chosen female of this generation, is next in line to die—unless Brenna can find a way to end the curse of the malevolent Woman in White. With coven protections breached, Sheriff Jake Tyler joins the battle. The witch and the shapeshifter search for answers to break the curse becoming closer every day. Passion overrules reluctance as their romance intensifies. But how can love grow when murder and violence threaten their world? To ask other readers questions about Haunting Magic, please sign up. 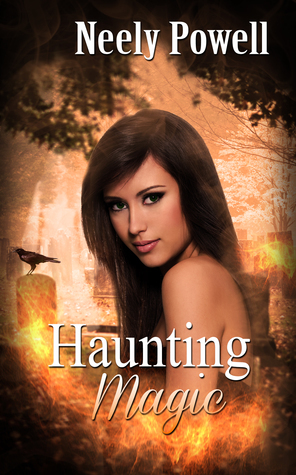 Haunting Magic is a gripping and suspenseful novel with vivid characters and an exciting plot. I loved the interaction between the various family members; each one has a very strong and unique personality. This novel is obviously part of a series, yet it stands on its own very well. I do want to read the previous story, but the author gives the reader enough background to keep them up to speed. Fiona and Brady have great chemistry but very different upbringings and outlooks on life. I really enj Haunting Magic is a gripping and suspenseful novel with vivid characters and an exciting plot. I loved the interaction between the various family members; each one has a very strong and unique personality. This novel is obviously part of a series, yet it stands on its own very well. I do want to read the previous story, but the author gives the reader enough background to keep them up to speed. Fiona and Brady have great chemistry but very different upbringings and outlooks on life. I really enjoyed reading of their growing relationship amidst the chaos stirred up by the Woman in White and her demon. They tried writing fiction together for several years, but life Neely Powell is the pseudonym for co-writers Leigh Neely and Jan Hamilton Powell. The best friends met when they both worked at a rock 'n roll radio station in Chattanooga. It turned out their husbands were long-lost high school buddies, and Jan and Leigh were both writing romantic fiction in their spare time. A partnership was born.